The market is almost closed. It's been a good week. 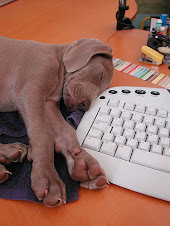 So -- relax and don't think about anything related to the market or the economy for the next few days. Carlos Cruz has a strategy for surviving the worst global recession in 60 years: pay less in taxes and pass the savings along to customers. “I’m declaring half as much as I used to,” said Cruz, 29, who runs a painting business in Madrid. “Prices have fallen by 30 percent and customers will choose you for a difference of as little as 50 euros ($67.70),” said Cruz, an Ecuadorian who has lived in Spain since 2001. Even as the U.S., Japan and Europe weather the first simultaneous recessions since World War II, some types of activity are expanding worldwide -- just below government radar. The production of goods and services that are lawful, though not declared, may grow the most as a proportion of total output since 2000, according to Friedrich Schneider, a professor at Austria’s Johannes Kepler University of Linz. In 21 of the 30 countries in the Organization for Economic Co-operation and Development, Schneider estimates the informal economy will equal 13.8 percent of official gross domestic product in 2009, up from 13.3 percent last year. On that basis, its value will climb by $200 billion to $5.59 trillion in those nations from $5.39 trillion, using constant 2008 GDP because data for this year isn’t yet available. I've always wondered how you counted an economy that by definition is not trying to be found. But that's neither here nor there at this point. All of the charts below have important technical information. In all three, prices have broken through both a downward sloping trendline that acted as upside resistance and lows established over the last few months. Both of these developments are technically very positive. In addition, now all three are above the all their respective SMAs -- another bullish technical development. 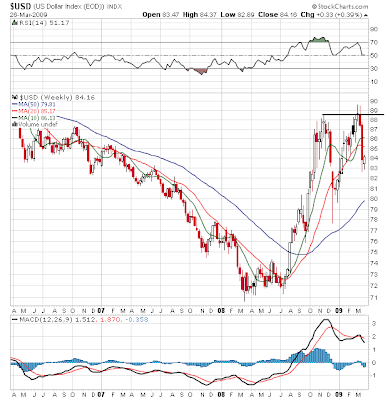 On the weekly chart, notice the dollar is clearly in a double top pattern and has now fallen from the second top. 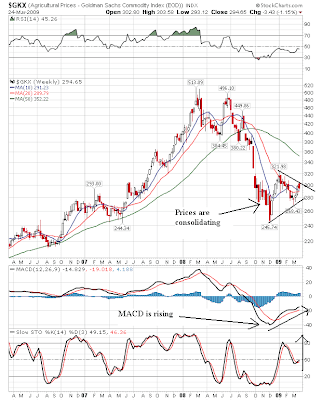 The MACD and RSI have followed, confirming the trend. Prices have fallen through the 10 and 20 week SMA which will pull those numbers lower. Although the long-term trend is still up (as evidenced by the increasing 50 week SMA) the fact that prices are now between a group of SMAs indicates the markets will probably be taking a breather right now. 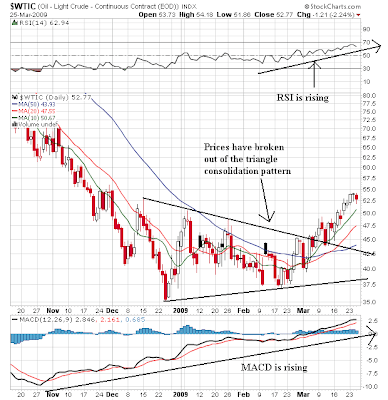 The daily chart shows the sell-off in more detail. Prices have clearly broken the upward sloping trend line that started in mid/late December of last year. 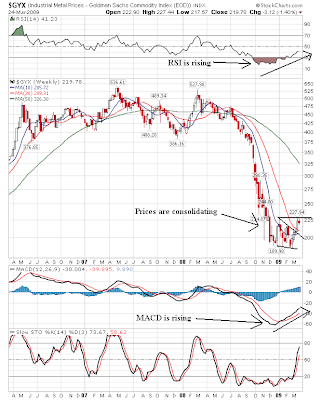 The MACD and RSI have also dropped, confirming the trend. The 10 and 20 day SMA are both moving lower, and the 10 day SMA has now moved through the 50 day SMA -- a bearish development. The rally continues. Prices are now above all the SMAs. in addition, the 10 day SMA is about to move through the 50 day SMA, which would be a very bullish event. Also note the 20 day SMA is moving higher and the 50 day SMA has lost its several downward sloping trajectory. Bottom line: this rally is looking very good right now. The U.S. economy experienced its most violent contraction in a generation during the fourth quarter, with real gross domestic product plunging at a 6.3% annualized seasonally adjusted rate, the Commerce Department reported Thursday in its third estimate of quarterly growth. Economists believe the current quarter, which ends March 31, was nearly as bad. Current projections look for GDP to fall at a 5.1% annual pace. Since 1947, GDP has never fallen by more than 4% for two quarters in a row. Some have a more extreme view: "The economy will contract by a staggering 7% to 8% in the first quarter, before the economy begins to stabilize,"wrote Nariman Behravesh, chief economist for IHS Global Insight. GDP is expected to fall 2% in the second quarter, according to a suvey of economists conducted by MarketWatch. Bank of England Governor Mervyn King says Gordon Brown should be “cautious” on public spending while the official in charge of U.K. bond sales says the central bank is undermining demand for government debt. For the first time in almost seven years, the U.K. couldn’t find enough buyers for one of its debt sales when it offered 1.75 billion pounds ($2.55 billion) of bonds yesterday. The yield on 10-year gilts rose after the sale by as much as 20 basis points, or 0.2 percentage point, to 3.53 percent, the highest since March 5. The failure came a day after King said the government needs to be “cautious about going further in using discretionary measures” to expand government deficits as it tries to pull the economy out of a recession. Robert Stheeman, head of the U.K.’s Debt Management Office, which runs the bond auctions, says it wasn’t able to attract enough bids partly because of the Bank of England’s efforts to lower yields through debt purchases. Investors say both are to blame for the failed debt sale. This is an interesting -- and partially scary situation. Like the US, the British are buying their own debt. But in doing so, they are artificially deflating the price relative to current demand. Because of the level of government spending, investors are concerned about repayment. As a result, the current interest rate provides insufficient risk compensation which led to the latest auction failure. Although some experts attributed the failure to confusion in the market, rather than concern over Britain’s solvency, it was highly embarrassing for Mr Brown coming just days before world leaders are due to meet in London for the G20 summit to discuss the economic crisis. Frankly, the Bloomberg explanation makes more sense: there is now increased risk in purchasing government debt. Investors want to be compensation for this risk. But the government buying debt and thereby keeping it artificially low is keeping private capital out of the market. 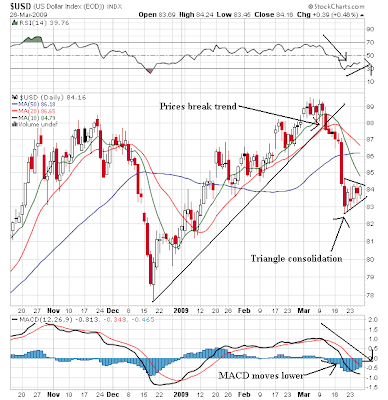 Oil prices -- which have been consolidating in a triangle consolidation pattern for the better part of 5 months -- have now broken out of that pattern. Prices are alos above the 10 and 20 week SMA, which will now provide technical support for sell-offs. 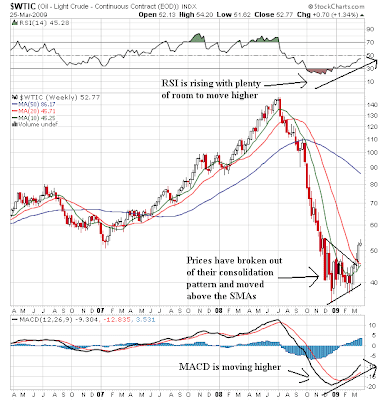 Also note the MACD and RSI are rising with plenty of room to move higher. This is a very bullish set-up. The daily chart shows more detail of the above actions. Notice that prices and the SMAs have now aligned in a very bullish configuration -- prices are above all the SMAs, all the SMAs are rising and the shorter SMAs are above the longer SMAs. In addition, the MACD has been rising for 5 months and the RSI has been rising for the last month and a half. This is also a good looking chart. The main takeaway from the daily chart is the rally is still intact; the upward sloping trendline is still providing support for the rally. New orders for manufactured durable goods in February increased $5.5 billion or 3.4 percent to $165.6 billion, the U.S. Census Bureau announced today. This increase follows six consecutive monthly decreases, including a 7.3 percent January decrease. Excluding transportation, new orders increased 3.9 percent. Excluding defense, new orders increased 1.7 percent. -- This is the first increase in 7 months. In other words, if we're looking for a trend, it's down. This would be the equivalent of a bear market rally. In addition, the non-seasonally adjusted numbers for total year to date new orders are down 28.4% -- hardly a great situation. Excluding transportation, that number is -22.4%. In other words, transportation isn't the problem; manufacturing as a whole is. The uptick is of course welcome news. However, after placing it in context, we learn we have a long way to go before we've seen an industrial rebound. Treasury Secretary Timothy Geithner and Federal Reserve Board Chairman Ben Bernanke called for broad new powers to regulate the nation's financial system on Tuesday, arguing that the $170 billion rescue of AIG and the outcry over its bonuses would have never happened if the government had the right regulatory system. American International Group Inc Geithner and Bernanke tried to change the subject to a more elevated topic: How to avoid the next mess. They said Congress should broaden the authority of financial regulators to cover institutions, such as AIG, that can pose systemic risks but that aren't regulated very well. If AIG had failed last September, the result could have been "a 1930s-style global financial and economic meltdown, with catastrophic implications for production, income and jobs," Bernanke said. The broader powers would give regulators tools to close down financial firms in an orderly manner and avoid a cascading collapse of financial market firms, the two officials told the committee. Geithner said the decision to seize a financial company deemed "too big to fail" would have to have the agreement of the White House, the Fed and other top regulators. There are several important points made above. 1.) AIG is catching a large amount of flack -- as well they should. But a central point is often lost in the stories: an AIG failure would have sent the financial system into a death spiral. What Bernanke and company want to avoid is the 1929 - 1933 period where a wave of financial failures sent the US economy into a 25% drop in GDP over a four year period. An AIG failure would have done that. As a result, they had to be saved. 2.) There is no national insurance regulator. Instead, regulation is left up to the states. This is a really stupid idea and needs to change pronto. The Obama administration is preparing an overhaul of U.S. banking rules that would force financial companies to keep more cash on hand in case their trading bets go wrong. The bottom line is the US financial system is going to be overhauled over the next few years -- as well it should. Even as a few rays of hope peek out for housing, a dark cloud of unlisted and unsold foreclosed homes threatens to further delay a recovery and undermine lenders' financials. The government is riding in with new programs almost every week, including Monday, that may rescue lenders. But they also cause paralysis in the short term. Lenders are holding "between 600,000 and 700,000 residential properties that are not on the multiple listing service (MLS)," said Rick Sharga, senior vice president at RealtyTrac, a foreclosure listing firm in Irvine, Calif. This shadow supply isn't counted as part of the housing inventory. There were 3.8 million existing homes on the market in February, equal to 9.7 months' worth at the current sales pace. Add in the shadow supply and selling all the available homes will take even longer, and that suggests prices have even further to fall. This is a really big issue with the housing market -- and one that is woefully underreported. Although I'm a bit behind on "hip" internet lingo, I think I have been dealing with posting "spam". So, here are some rules for posting on this blog. I'm now approving all postings which I do several times every day. Sorry for this, but frankly the spam was getting really annoying. -- There's upward room for the stochastics. Bottom line: both charts are still consolidating. It's been a long time since I've seen a 5 minute chart that looked like this. Boy does it look good. This is a solid rally. Notice that prices have been rallying for the entire period, but have engaged in solid moves followed by profit-taking and consolidation areas. On the daily chart, it's important to point out possible levels where prices could sell-off to in the eventual sell-off. Therefore, take note of all the Fibonacci levels along with the moving averages because these are possible support levels. Also note there are plenty of support levels out there, which should help everybody breath more of a sign of relief right now. World airlines are set to lose $4.7 billion this year as a result of the global recession that has shrunk passenger and cargo demand, industry body IATA said. The International Air Transport Association had estimated in December the industry would lose $2.5 billion in 2009. "The state of the airline industry today is grim. Demand has deteriorated much more rapidly with the economic slowdown than could have been anticipated even a few months ago," Director-General Giovanni Bisignani said on Tuesday. "The relief of lower fuel prices is overshadowed by falling demand and plummeting revenues. The industry is in intensive care." IATA, which represents 230 airlines including British Airways (BAY.L), Cathay Pacific (0293.HK), United Airlines (UAUA.O), and Emirates (EMIRA.UL), also raised its estimate of international airline losses in 2008 to $8.5 billion, from its previous $8 billion estimate. We'll need better news from the transportation sector before we can say the economy is moving at top speed. Purchases rose 5.1 percent to an annual rate of 4.72 million from 4.49 million in January, the National Association of Realtors said today in Washington. The median price slumped 15.5 percent from a year ago, the second-biggest drop on record, and distressed properties accounted for 45 percent of all sales. Home sales have been falling since 2005 and prices peaked in 2006. The S&P/Case-Shiller home-price index of 20 metropolitan cities was down 18.5 percent in December from a year earlier, a record decline, the group said last month. Frankly, the only statistic I need to see right now is the year over year price number. So long as we're seeing double digit declines we're nowhere near a bottom in housing. When we start to see YOY price declines slow to 5% or so, then we'll be able to start talking about a bottom -- but not until then. The realtor group’s affordability index reached a record high in January. Fed policy makers last week announced the central bank will buy as much as $300 billion in long-term Treasuries and more than double mortgage-debt purchases to $1.45 trillion. The central bank had already committed to buying $600 billion of mortgage-backed securities and bonds sold by government- sponsored housing agencies. Regarding the "first time home buyer tax credit is spurring demand" argument, the tax credit itself is really an interest free loan from the government rather than a real tax credit. Just to remember where we are, Treasury prices spiked at the end of last year in response to the credit crisis. However, prices have come down since then, although they are still above the 200 day SMA and the line of support established from the high in September of last year. On the three month chart, we see the rally that occurred after the Fed's last policy statement where they essentially said they would be purchasing Treasuries. Since then, prices have sold off. However, the Fed essentially put a floor in Treasury prices with it's announcement. The market opened with a big gap up and moved higher until lunch and then sold off a bit. Then prices continued their move higher, closing at session highs on strong volume. On the daily chart, notice that prices moved above the 50 day SMA today. That's incredibly important from a technical level right now. Also note that prices moved though key technical resistance levels today. Bottom line: this is a nice looking chart. In addition, I'm expecting prices to pull back to technically important levels over the next few weeks. We all know that Krugman is against the plan. However, Galbraith offers some great observations. However, the financial system as a whole is still working against recovery. Many banks, still burdened by bad lending decisions, are holding back on providing credit. Market prices for many assets held by financial institutions -- so-called legacy assets -- are either uncertain or depressed. With these pressures at work on bank balance sheets, credit remains a scarce commodity, and credit that is available carries a high cost for borrowers. This program to address legacy loans and securities is part of an overall strategy to resolve the crisis as quickly and effectively as possible at least cost to the taxpayer. The Public-Private Investment Program is better for the taxpayer than having the government alone directly purchase the assets from banks that are still operating and assume a larger share of the losses. Our approach shares risk with the private sector, efficiently leverages taxpayer dollars, and deploys private-sector competition to determine market prices for currently illiquid assets. Simply hoping for banks to work these assets off over time risks prolonging the crisis in a repeat of the Japanese experience. We cannot solve this crisis without making it possible for investors to take risks. While this crisis was caused by banks taking too much risk, the danger now is that they will take too little. In working with Congress to put in place strong conditions to prevent misuse of taxpayer assistance, we need to be very careful not to discourage those investments the economy needs to recover from recession. The rule of law gives responsible entrepreneurs and investors the confidence to invest and create jobs in our nation. Our nation's commitment to pursue economic policies that promote confidence and stability dates back to the very first secretary of the Treasury, Alexander Hamilton, who first made it clear that when our government gives its word we mean it. 1.) First -- I like the term "legacy assets". It's a nice and polite way of saying, "we're stuck with some really old garbage". Now -- let me back up a bit further and provide a bit of a history lesson here. Securitization -- the process of taking single loans, pooling them with other loans of similar qualities (same interest rate, maturity date etc..) has been around for about 30 years now. For anyone who wants to really delve into this process, read any of the fixed income books by Frank Fabozzi. In other words, the problem hasn't been the system of securitization. Instead the problem has been the "lend to securitize" market of mortgage lenders that sprung up over the last 15 years like weeds. These lenders had no incentive to make quality loans because they sold the loans off faster then the loans would go bad. These are essentially mortgage related assets who's value is depressed right now thanks to the housing market. There are a lot of questions related to these assets. Let's start with the big one: what are they worth? The problem is most of these assets are "thinly traded" -- meaning there aren't enough trades to determine an "average price". And therein lies the real problem with most of these bonds -- we can't figure out what they are worth. Secondly, is their price unrealistically low right now because of the problems in the housing market? That is, are prices unrealistically depressed? There is no answer to this question. Most owners would say yes -- which explains why they are arguing for a relaxing of the mark to market rules. In general I would agree with this sentiment, but only by adding this very important caveat: prices are depressed if the owner's intention is to hold the asset to maturity. Finally, will these assets increase in value over time to where a profit can be made? No one really knows the answer to this question either, although assuming the maturity date is far away enough (say 10+ years) the answer is probably yes. * Maximizing the Impact of Each Taxpayer Dollar: First, by using government financing in partnership with the FDIC and Federal Reserve and co-investment with private sector investors, substantial purchasing power will be created, making the most of taxpayer resources. * Shared Risk and Profits With Private Sector Participants: Second, the Public-Private Investment Program ensures that private sector participants invest alongside the taxpayer, with the private sector investors standing to lose their entire investment in a downside scenario and the taxpayer sharing in profitable returns. * Private Sector Price Discovery: Third, to reduce the likelihood that the government will overpay for these assets, private sector investors competing with one another will establish the price of the loans and securities purchased under the program. The Merits of This Approach: This approach is superior to the alternatives of either hoping for banks to gradually work these assets off their books or of the government purchasing the assets directly. Simply hoping for banks to work legacy assets off over time risks prolonging a financial crisis, as in the case of the Japanese experience. But if the government acts alone in directly purchasing legacy assets, taxpayers will take on all the risk of such purchases – along with the additional risk that taxpayers will overpay if government employees are setting the price for those assets. So -- the government provides some funding, to be matched by the private sector. The plan states this will "maximize the impact of each taxpayer dollar" and "share the risk", both of which are fundamentally true assuming, of course, there is a desire by the private sector to participate. Assuming that is true, then the two propositions are true. * Banks Identify the Assets They Wish to Sell: To start the process, banks will decide which assets – usually a pool of loans – they would like to sell. The FDIC will conduct an analysis to determine the amount of funding it is willing to guarantee. Leverage will not exceed a 6-to-1 debt-to-equity ratio. Assets eligible for purchase will be determined by the participating banks, their primary regulators, the FDIC and Treasury. Financial institutions of all sizes will be eligible to sell assets. * Pools Are Auctioned Off to the Highest Bidder: The FDIC will conduct an auction for these pools of loans. The highest bidder will have access to the Public-Private Investment Program to fund 50 percent of the equity requirement of their purchase. * Financing Is Provided Through FDIC Guarantee: If the seller accepts the purchase price, the buyer would receive financing by issuing debt guaranteed by the FDIC. The FDIC-guaranteed debt would be collateralized by the purchased assets and the FDIC would receive a fee in return for its guarantee. * Private Sector Partners Manage the Assets: Once the assets have been sold, private fund managers will control and manage the assets until final liquidation, subject to strict FDIC oversight. 2.) Private bidders arriving at a price the banks are willing to take. These two points are critical. 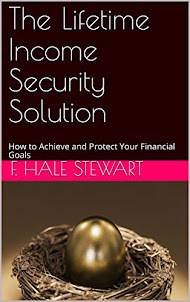 There is nothing forcing banks to participate in the program. And that is the real problem. And there is a big reason keeping the banks from participating: finding out that various assets aren't worth anything. However, assuming banks are willing to play this isn't bad. I would change a few things -- the most important being the government provided leverage. I think the private sector should pony up a whole lot more. But that's just my opinion which is completely unsolicited. In addition, no plan is perfect. There are no guaranteed solutions to any of our problems right now. Specifically, nationalization has a ton of problems associated with it. However, overall I think this is workable. -- The market has enjoyed one heck of a run, moving from roughly 67 to 76. -- Prices moved over the 50 day SMA but couldn't keep above it. -- Notice there have been some incredibly strong bars during this rally. The chart from last week shows a two and a half day rally that ended near the end of trading on Thursday when prices fell through the upward sloping trend line. Notice that during the rally prices formed numerous bull market flags to consolidate gains. The sell-off lasted for most of Friday and is most likely the result of natural before the weekend profit taking; no one wants to hold a position in this market over a two day weekend.